A Japanese honey bee has been bred in various places from of old. Various devices have been done as Japanese bee's nest insect Wax Moth(Galleria melonella). It is a device of the bottom plate of the slide type this time. Breeding of a Japanese bee is comparatively easy. However, it runs away at once if the bee likes neither the box in the nest nor the environment. The bee might run away even if the nest insect Wax Moth, (Achroia innotata obscurevittella or Galleria mellonella cankerworm) is generated in the box in the nest. Therefore, it is necessary to clean the surrounding in, especially the bottom plate the box in the nest beautifully regularly. This photograph is a bee's house of the person who started the apiculture of a Japanese bee recently near my home. Then, because the bee's house of the slide type had been seen. Externals size of the bee's house was about 325 mm aquare. Board thickness was about 14mm. Height was about 120mm a step. It was sealed up to the joint in interilevel with the packing tape. The roof was a corrugated plate of the slate. 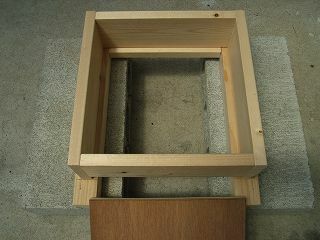 It is a photograph in the the lower of the breeding box for a Japanese bee that this made the bottom plate slide type. Externals size of this bee's house is about 300mm in length and breadth, about 89mm in height, and the board thickness about 19mm. The length and breadth of externals size decided to be united to 300mm by thinking about the interchangeability of the bee's house in the future. The material chiefly used the SPF1X4 material. The stand processed and used the SPF2X4 material. The block is separated a little right and left and 2-3 steps are piled up. Moreover, the breeding box of the nest of boxes type in the the lower is put. 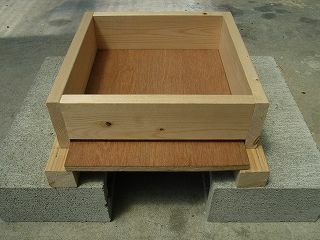 The bottom plate in this breeding box can be pulled out ahead by doing in the breeding box in the slide. The material in the bottom plate used the plywood board of 12mm thickness. The space of about 7mm is installed between the front side and the bottom plate of the breeding box and it makes it to bee's gateway. The bottom plate can be easily pulled out by doing so. The board made a nest gate cuts out 12mm+7mm=19mm. Moreover, it can see in the bee's house by pulling out the bottom plate, and taking hand glass to the bottom in the box. It is possible to take a picture with the digital camera. I have found the fault of this method though it is no mean excellent one. As for it, the interval at the nest gate narrows when the bottom plate is transformed. According to circumstances, the bee might not be able to go in and out to the bee's house. Then, the wedge of about 6-7mm(splittable wooden chopsticks were acceptable) was added between the bottom plate and the bee's house of the slide type. The interval of 6-7mm or more can be secured even if it transforms it a little. It is the one that the breeding box where this had removed the slide type bottom board was seen on. If it is this, it is understood to be able to clean the bee's house easily. Because it was a quite good idea, I was going to adopt it immediately. When the slide type bottom board is not used, the wire net might be used for the bottom plate during summer as a nest insect counterplan. A lot of people seem to adopt this. A bee's house actual as for me has been seen. The bottom plate of the slide type and the bottom plate can be made the one with the wire net. Ventilation improves in summer. Only it is to change the bottom plate, it is possible to do easily.